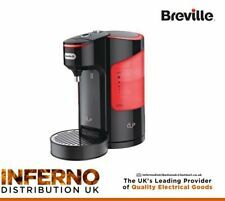 BREVILLE HOT CUP ENERGY SAVING KETTLE BLACK VKJ318. Variable dispense. 2 litre capacity. Transparent water tank. Non slip feet. Large water window. Polished stainless steel and black. Blue illumination on boil. 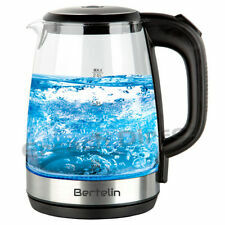 Cordless Illuminated Glass Electric Kettle 2.0L - Blue Illuminating. Glass electric kettle. Boil dry & overheat protection. Blue illuminating - Features an illuminated display that turns blue as water boils. Automatic Switch Off: automatic switch off and boil dry protection - automatically detects that there is no water in the vessel and turns the kettle off. 360 Degree Cordless Rotation Swivel Base: This kettle boasts a smooth handle and convenient 360° cordless swivel base with handy cord storage to keep your kitchen counter less cluttered. It’s not new but very good working condition. BREVILLE HOT CUP ENERGY SAVING KETTLE BLACK VKJ784. Variable dispense. 2 litre capacity. Transparent water tank. Non slip feet. Large water window. Polished stainless steel and black. Manual stop function. One-touch operation with hinged lid for easy filling: perfect for those that cannot lift a heavy kettle. 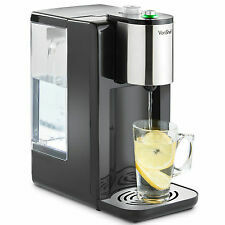 Dispenses one cup of boiling water at the touch of a button, so you only boil what you need. Large front water window makes accurate filling easy. Translucent cream 2 litre whistling kettle originally purchased from Argos. Excellent condition as only used once in a power cut!! Can be used on all hobs except induction ones. Le Creuset GREY Kettle. 2.1 l Capacity. suitable for all heat sources. Has been used but is in good condition but does need descaling. Le Creuset Traditional Kettle with Whistle 2.1 L-Red. As new condition paypal only no returns thanks Dispatched with Royal Mail 2nd Class. Easy to refill using a jug the HotCup is perfect for those who struggle to lift a heavy kettle. Breville HotCup with Variable Dispenser VKT111. The variable dispense feature has 11 different pre-set amounts up to 300ml to choose from. 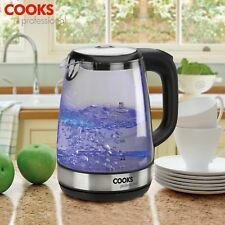 2.0L Blue LED Illuminated Cordless 360 Degree Black Glass Kettle. Automatic Switch Off: automatic switch off and boil dry protection - automatically detects that there is no water in the vessel and turns the kettle off. A heat resistant handle protects you from burns and also folds down for convenient storage. Made from strong, yet lightweight, stainless steel the kettle is very easy to clean. Flip Top Whistle. Durable Stainless Steel Construction. Aqua Optima Aquis Water Filter Kettle - White. 1 x Aqua Optima Aquis Water Filter Kettle. 3kW rapid boil technology. Features a built in water filter. UK 3-Pin plug. Type : Paint Kettle. Suitable for use with all paint brushes up to 150mm/6”. - images are for illustration purposes only. View this range. Capacity : 2L. Product Number : 315. Office Supplies & Stationery. Le Creuset 1.1 litre whistling kettle in white. Used once only and in excellent condition. Suitable for use on most heat sources. Application:Induction, Ceramic hobs, Gas cooker, Electric cooker. Traditional kettle shapes have been combined with original colours and modern stainless steel lids. They are compatible with all kinds of cookers, both traditional and inductive. 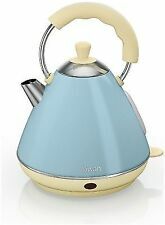 Beautiful Pastel Green whistling stove top kettle. Condition is New. This was £37.99 new from Dunelm. Features 2L capacity = 8 cups Boiling water whistle high-grade stainless steel Double handle Durable double thick stainless steel base Removable lid for easy filling Suitable for Gas, Electric, Ceramic and Induction hobs Dispatched with Royal Mail 2nd Class. Le Creuset Whistling Kettle in orange 2.1 Litres In Good Condition. Condition is Used. Dispatched with Royal Mail 2nd Class. Le Creuset Traditional Kettle with Whistle, 2.1 L - Black. Condition is Used. Dispatched with Royal Mail 2nd Class. Off White Le Creuset Kettle Traditional Stovetop Enameled Steel 2.1 L. Condition is Used. Pls see slight dent and chip in enamel in pictures. Despatched 2nd Class. Seller away until 2nd week in May. In good condition with no large dents, just a tiny 3mm one on bottom rim near base (shown). Also there is hard water residue (?). around the lid hole, which may be cleanable. Handle sturdy, lid fitting tight and whistle working as should. Le Creuset Traditional Teakettle Blue with Lid. Condition is Used. Collection in person only. Made from strong, yet lightweight, stainless steel the kettle is very easy to clean. Colour Orange, No Assembly require Even Heat Distribution, Flip Top Whistle. If they are still unsuccessful they will either. Aga stove top kettle. Condition is Used. Dispatched with Royal Mail 2nd Class. Prestige 2L Stove Top Kettle. Condition is Used. Dispatched with Royal Mail 2nd Class signed for. Slight rusting around rim as seen on pictures. STAINLESS STEEL WHISTLING KETTLE. GOOD CONDITION. Your morning coffee is never far away with this water dispenser from Breville. With its 2 litre tank, it’s perfect for hosting afternoon tea for your friends. As it has a 3000 Watt power output, your guests will never wait long to start sipping their favourite hot drinks. 1X Electric kettle. Material: Stainless Steel. Color : Silver. Due to the different display and different light, the picture may not reflect the actual color of the item. If you haven't received ite. Classic whistle sound. Suitable for induction stoves. Stainless Steel Kettle for Aga or similar. Used. 2l capacity. Heatproof handle. Some limescale on inside,otherwise good quality. Style: Electric Kettle. 1 x Jug Kettle. Product categories: Electric kettle. Capacity: 2L. Tick label: Pot marking. Operation mode: Button type. Heating Speed: 4-6 minutes. Scale Mark: Mark InWall. As good as new, only used once, Prestige stove top almond 2L whistling kettle. No marks, dents or scratches. Aga Whistling Kettle 2.2 Litre . Condition is used so expect light usage wear and there is also a minor chip to handle at front and another on side as shown and a ring of Limescale within as shown in last photo and some light scale on the outside. Look intently at the photos as they are a part of the description. This great Whistling Kettle can be described as a perfect hybrid of modernity and traditional look. The kettle would be an ideal asset in every kitchen. Material:made of high quality Stainless Steel. Whistling function. H:22cm W:21cm Dia:18cm.